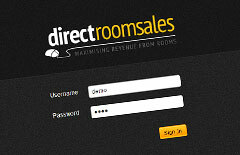 The DRS Hotel Booking System can be purchased on an annual basis for minimal upfront costs. Bookings are taken directly from your customers without commission whether online via your website or over the phone. In trial, users of DRS Booking Software found that admin time required to process bookings and manage rooms was reduced to 1/3rd, a significant saving in staff costs. The attractive and simple frontend booking page for customers increases bookings made on line directly by customers. In trial, users have found over a third of their bookings being made on line directly by customers. 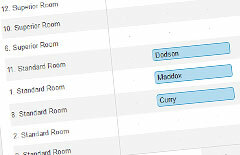 The DRS Hotel Booking System is web-based and accessed using any PC or Mac. No on-site software or hardware installation is necessary. Bookings to be taken quickly and efficiently both onsite and remotely. The system is easy to use for all members staff. Following initial training included in the installation, new staff will be able to take bookings with less than half an hours training. The safeguards in the system ensure bookings are taken at the right rate and for the right length of stay. A water-tight booking process means payment from a customer can never be missed. Avoids storing credit and debit card details, assuring full legal compliance. As standard payments are processed by SagePay and passed to your account in full within two working days. The DRS Booking System can be seamlessly integrated into your existing website for a smooth, customer-friendly user experience. BF Internet are experts in data integration. Whatever EPOS, accounting or back-office system you use; the Hotel Booking System can be integrated to send live customer data back for a unified business system. The DRS booking system integrates with the LCR Apollo EPOS system as standard. Add a link to your TripAdvisor profile featuring your rates and availability, sending visitors directly to your booking system. Your TripConnect link will appear alongside links from Online Travel Agents, giving you an incredible opportunity to generate incremental revenue and maximize direct bookings. Easy to configure and use, the rooms management tools include room prioritisation, length of stay, day by day pricing model, capping number of rooms sold at discounted rates, facilitating special offers to drive business. These features will help maximise returns on your business assets. Training in using the rooms management features is included in the fee. Additional training regarding rooms and revenue management, sales and marketing to increase occupancy and revenue can be purchased. 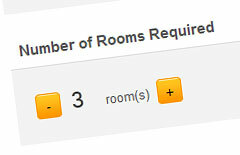 Maximise sales by offering guests the facility to arrange room extras as they book. For bookings taken over the telephone, the DRS Hotel Booking System allows the details of previous guests to be retrieved, aiding the booking to be taken swiftly and improving customer relationships. With other systems your booking data can become ‘trapped’, meaning you’re unable to obtain backups, spreadsheets for reporting or databases for marketing. With DRS Booking Software you have full access to your booking data to export whenever you need for interrogation in excel. The email addresses of your guests can be easily exported into ‘Emailtool’ (available from bfinternet) for use in newsletters and mailings. A bespoke set of reports for rooms management and analysis can be purchased to further understand and grow your rooms business. All aspects of the customer booking process can be customised according to your requirements. Some basic customisation is included in the installation and annual fee, further bespoke requirements can be purchased. The booking system can support multiple premises. 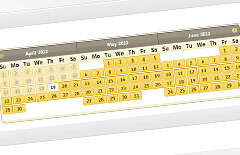 The web-based interface allow bookings to be taken from any location, including a central bookings office.